We no longer accept unsolicited manuscripts, but we do offer unpublished and unagented writers of children's fiction the chance to submit their work to the annual Times/Chicken House Children’s Fiction Competition. We're looking for original ideas, a fresh voice, a diverse range of entries and stories that children will love! We’d particularly like to encourage entry for BAME writers and others from underrepresented backgrounds. First prize is a worldwide publishing contract with Chicken House with a royalty advance of £10,000, plus representation from a top children’s literary agent. This year’s competition is our tenth and we’re offering a brand new prize to celebrate a decade of finding and launching wonderful new talent in children’s fiction. The ‘Chairman’s Choice’ prize is a publishing contract with a royalty advance of £7,500 plus representation. The prize will be awarded to a manuscript hand-picked by Barry Cunningham, our Publisher and the Chairman of the Judging Panel, for work that promises outstanding potential but requires more editorial input than the overall winner. Entry to the 2019 competition has now closed. We aim to announce the longlist on the website in May, the shortlist in June, and the winner in August. You can follow us on Twitter (@chickenhsebooks) to keep up with all the latest news and details of when entry to the 2020 competition will open. The Times/Chicken House Children's Fiction Competition is now closed! The main prize is a worldwide publishing contract with Chicken House with a £10,000 advance (subject to contract). Our esteemed panel of judges will select the overall winner, who will also receive an offer of representation from a top literary agency. 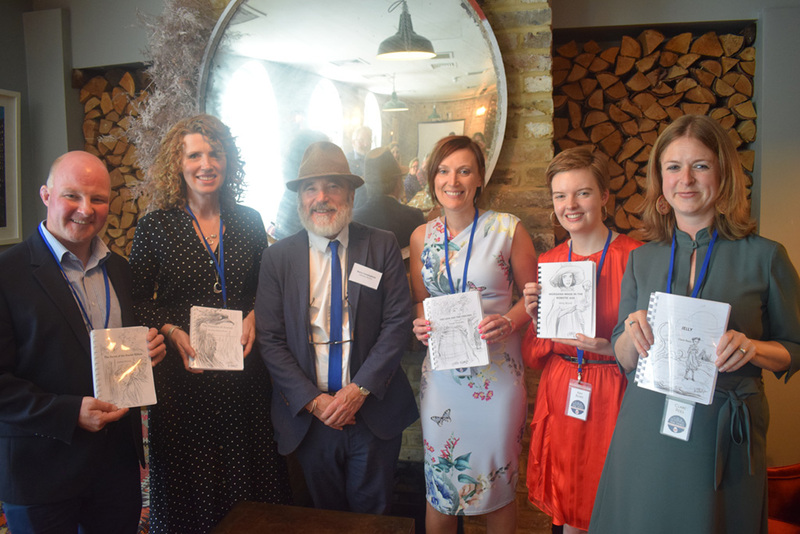 The winner will be the entrant whose story, in the opinion of the judges, demonstrates the greatest entertainment value, quality, originality and suitability for children. Our bonus prize will be awarded to an author hand-picked by our Publisher and Chairman of the judging panel, Barry Cunningham. The prize is a worldwide publishing contract with Chicken House with a £7,500 advance (subject to contract). The winner will have outstanding potential but may require more development than the Overall Winner. Our annual competition opens on 31 August 2018. The deadline for entries will be at midnight on 28 February 2019. Any entries received after the deadline will be disqualified, unless you have experienced technical difficulties which prevented you from submitting successfully before the deadline. Please ensure you enter in good time! There are two ways to enter the competition, online OR (for UK entrants only) by post. Please choose one of these options and follow the instructions below. If you have any questions regarding entry to the competition, please see our Competition FAQs or, if you can’t find your answer, email hello@chickenhousebooks.com. ... for entering the competition! Take a look at our Writers' Guide – packed with useful hints and tips, plus a list of invaluable resources & links to useful organisations, it’s a great place to start. My online entry has failed, what should I do? In the first instance, please ensure you have followed these step-by-step instructions. If the problem persists, please email sarah@chickenhousebooks.com. Can I enter my picture book/novel for adults/short story/short story collection/non-fiction book into the competition? No. The competition is for full-length children’s novels only. Can I enter two or more novels into the competition? No, we can only accept one manuscript per entrant. Can I enter my covering letter and synopsis in separate documents from my manuscript online? No. There is no option to enter multiple documents via the submissions portal. Our readers will be reading the submissions electronically and will need your submission as a single document to prevent any confusion. I have already self-published my novel. Can I still enter it into the competition? Yes, you may still submit a novel if it has been self-published. If you’re entering by post, you may send the self-published copy if you wish to. Can I pay online but post a physical copy of my submission – or enter my submission online but pay by cheque? No. Unfortunately, to avoid confusion, you must enter and pay either entirely online OR entirely by post. I have previously had published a short story/poem/picture book/non-fiction/academic title. Can I still enter? Yes, you are eligible as long as you haven’t had a full-length children’s novel commercially published, anywhere in the world. I have a literary agent. Can I still enter? No, agented authors are not eligible to enter – after all, we accept ordinary submissions via all established literary agencies. If you gain representation after entry, contact kesia@chickenhousebooks.com to withdraw your submission, but please be aware that we cannot refund your entry fee. I have entered my manuscript into the competition before, but wish to submit it again. Can I? Yes. We understand that manuscripts can change significantly between drafts and we encourage writers to continue to improve their work. I am under 18. Can I enter? No. For legal reasons, the competition is open to writers over the age of 18 only. If you are under 18 and would like to receive an email with advice for young writers, please email sarah@chickenhousebooks.com. Is the competition open to international entrants? Yes, however you will have to enter online. If submitting by post, can I pay with cash/postal orders? No. We cannot process cash or postal orders for postal entries, only cheques. I’ve entered the competition by post, but my payment hasn’t been processed. Does this mean my entry was not accepted? It can take a while for all cheques to be processed. Your entry will still have been submitted into the competition – we’ll only be in touch if there’s a problem, so don’t worry! For postal entry, does my entry have to arrive by the closing date, or just be postmarked by that date? I’m not sure how to write a good covering letter and synopsis. Can you offer me some advice? Both your covering letter and synopsis should not exceed a page each in length (single spaced). Your covering letter should consist of an introductory paragraph, a pitch about your novel and why you think it would appeal to the target audience, and a paragraph about yourself including any relevant writing experience. Your synopsis should be a factual explanation of the events in your book: please include all the major events, including the ending – no cliff-hangers, please! Who will read my manuscript, and can they offer me some feedback? In the first instance, your manuscript will be randomly allocated to one of our team of readers – these professionals work in children’s publishing and are experts at spotting literary talent. This team will select a longlist, which will then be scrutinised by Barry Cunningham and the Chicken House editorial team, who will select approximately five titles for the shortlist. Our prestigious panel of judges from across the publishing industry will read and discuss the shortlist before deciding on a winner. We offer a reader’s report for all longlistees (and supply judges’ feedback for shortlistees) but unfortunately, due to the large number of submissions received, we cannot offer feedback for everybody else. When will I hear whether I have been longlisted or shortlisted? We aim to announce the longlist on our website in May, the shortlist in June, and the winner in August. You can follow us on Twitter (@chickenhsebooks) to keep up with all the latest news. Will I be informed if I am not successful in reaching the longlist? Due to the number of submissions we receive, we will only get in touch with you if you are longlisted for the competition. If you have not heard from us by the time the longlist is announced, you have unfortunately been unsuccessful on this occasion. However, you are welcome to enter the competition again next time. Should I include my name in the submission, or are submissions anonymous? Submissions are not anonymous. Please do include your name and contact details with your submission if you enter by post. If you enter online, these details are automatically included along with your submission. If you wish to include a header on each page with the entry title and your name, please feel free to do so. I have submitted online but although I’ve completed all the steps, the status of my order is still ‘processing’. Does this mean you haven’t received my entry? No, not necessarily – the order status only changes from ‘processing’ to ‘complete’ once we have downloaded your document onto our database. Sometimes there will be a delay before we are able to do this, for instance if you submit outside working hours. We will contact you if there are any issues regarding your submission. If my order still shows as ‘processing’ after the competition deadline has passed, will I be disqualified? No, certainly not – the order status only changes from ‘processing’ to ‘complete’ once we have downloaded your document onto our database. Due to the expected volume of submissions there may be some delay in downloading all entries. We will contact you if there are any issues regarding your submission.